Genuine real-time access management, fast deployment and energy efficiency during operation: these were the key demands of the Maimónides Biomedical Research Institute of Cordoba (IMIBIC), part of the city’s university campus. To handle daily traffic of around 270 people, IMIBIC chose SMARTair™ Wireless Online electronic access control to secure the centre’s interior and exterior doors. The flexibility of a SMARTair™ system makes it easy for facility managers to program access rights tailored to each individual user, ensuring only the right people get access to the right areas, and only at the right times. The same system also comfortably manages much greater numbers of temporary visitors, during the Institute’s frequent external events. A single wireless system protects the main entrance; radioactivity, cytometry and genomics labs; operating rooms; and other sensitive areas, where trustworthy access management is critical. Authorised staff can also access another IMIBIC facility, inside the Reina Sofia University Hospital, with their credential. Because there’s no wiring, installation was fast and unobtrusive. 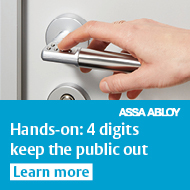 Battery-powered devices are much more energy efficient than mains-powered access control. Maintenance is minimal; just a new standard battery every 40,000 cycles. Plus, there was no need for IMIBIC staff to swap their existing access card, because SMARTair™ is compatible with all major RFID technologies. The powerful functionality of SMARTair™ Wireless Online management enables facilities managers to admit staff remotely, from anywhere, should someone lose or forget their credential. Using the intuitive Wireless Online system software, a real-time overview of access system status is easily generated at any time. It’s also simple to issue timed access control permissions tailored to the needs, responsibilities and profile of every individual site user. With two years’ use — and several fire drills successfully completed — SMARTair™ has been thoroughly and successfully tested in IMIBIC’s demanding security environment.